Hello and Sat Sri Akaal! My Background: I work for a large multinational engineering and professional services consulting firm in Edmonton, Alberta. My father is a retired army officer and my mother is a homemaker. I also have a younger brother. I completed my undergraduate studies at the University of New Brunswick and thereafter found work in Alberta. Edmonton has been home for me since 2008. More About Me: I like reading, listening to music/katha, and exploring the outdoors. My friends would describe me as a God-fearing person who is compassionate, hard-working, and humorous. I believe only in Sri Guru Granth Sahib Ji. My Expectations: I am searching for someone whom I can be a great companion, friend, and life-partner to.  My ideal partner would be one whose beliefs and way of life are rooted in Sikhi. P.S. I do not believe in the caste system or dowry and would prefer a simple... more marriage. Also, this profile is co-managed by my parents. I have a middle class family background with traditional values. My father has retired while my mother is a homemaker. I have 1 brother.